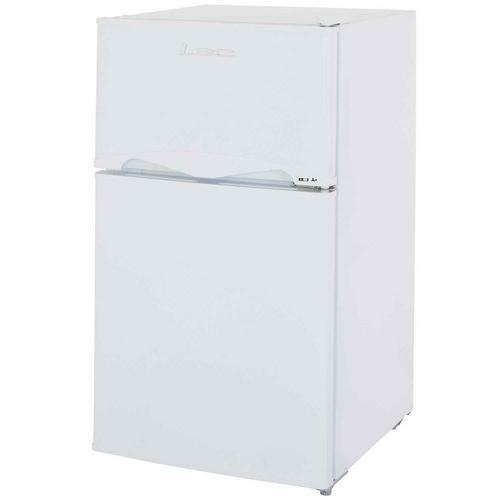 Enjoy streamlined under-counter refrigeration without foregoing a freezer compartment with the Lec T50084W Freestanding Undercounter Fridge Freezer. At just 48cm wide, this slim model will fit where other fridge freezers won't providing you with a great option if space is at a premium in your household. The T50084W features an A+ energy rating, ensuring you can take control of your rising energy bills and bring down the cost of running your home. With 77 litres of usable space in the fridge and 35 litres in the freezer, this unit is ideal for homes where fresh food is embraced. - a salad compartment to keep your salad crisp and fresh. Adjustable feet provide easy levelling and a reversible door suits the layout of your kitchen. Controlling the temperature is easy with the adjustable thermostat, and an interior light makes for bright viewing of the fridge interior. Noise levels are also at a minimum with this device, emitting only 42db when running - the average conversation between two people is between 60-70db meaning this appliance is discreet. With an Energy Saving Rating of A+ and recommended by the Energy Savings Trust, you know you are getting a really efficient appliance which also helps the environment - costs less than 10p per day to run (annual consumption of 167.9wh energy). Comes Complete with a 1 year warranty from the manufacture, LEC. This looks great in my new kicthen i got from b&q. And much cheaper than they were looking for a lesser fridge. I have heard of LEC for years as the fridge i was being offered was a matsui? not sure about that.